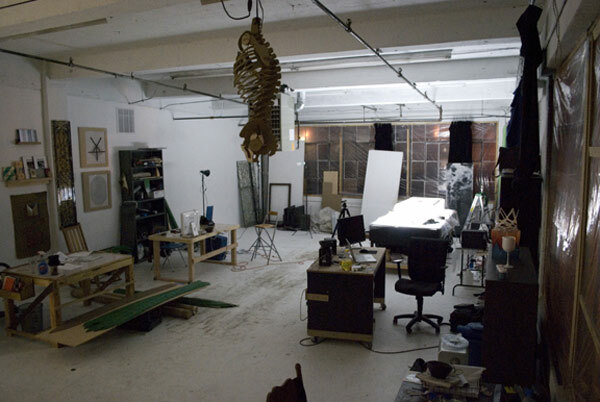 CHICAGO — The tenth installment of a series (Part 1, Part 2, Part 3, Part 4, Part 5, Part 6, Part 7, Part 8, Part 9) in which artists send in a photo and a description of their workspace. Click here to see guidelines for submissions. This is the most luxurious, glorious space I have ever had to work in. 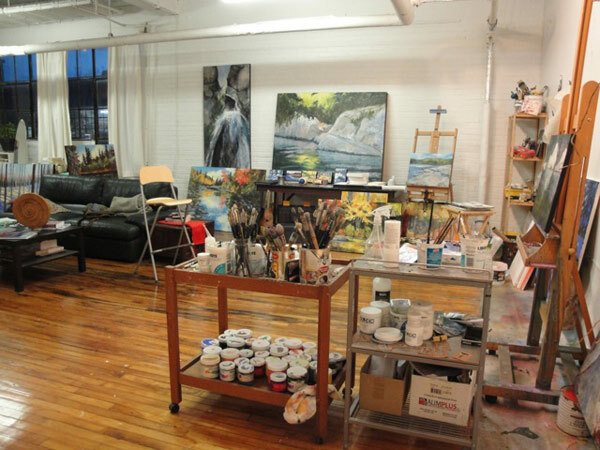 It is a 1,000 sq ft studio in a converted mattress factory. I share the studio with another painter, Walt Pascoe. I am usually working on several pieces at a time so I have a few easels and a huge wall to work on. I love that I have enough space to work on four or five canvases at the same time. Working in this manner allows the paintings to inform each other. Generally there is music flowing throughout the space which helps me to let go of my chattering brain and enter into a more intuitive state as I approach the paints. There is a great couch for napping, reading and daydreaming. There is a small kitchen for food and coffee breaks and lots of other artists in the building for feedback and stimulation, although most of the time I prefer to work in solitude and let the paintings guide and instruct me. There is a long drop cloth up against the wall for when I begin to work and things are loose and messy as I spray the painting continually with a spray bottle to keep things loose and open at the beginning. There are shelves of different mediums and textures that I apply as I feel the need, as well as many collage materials near at hand. The paints themselves are on two rolling table/carts that follow me around the room as I move from canvas to canvas. This is my world, my life, my breath. This is where I come alive and feel like a wild wolf running through the forest when I am fully engaged with my paints. This is my studio here in my home in Los Angeles. 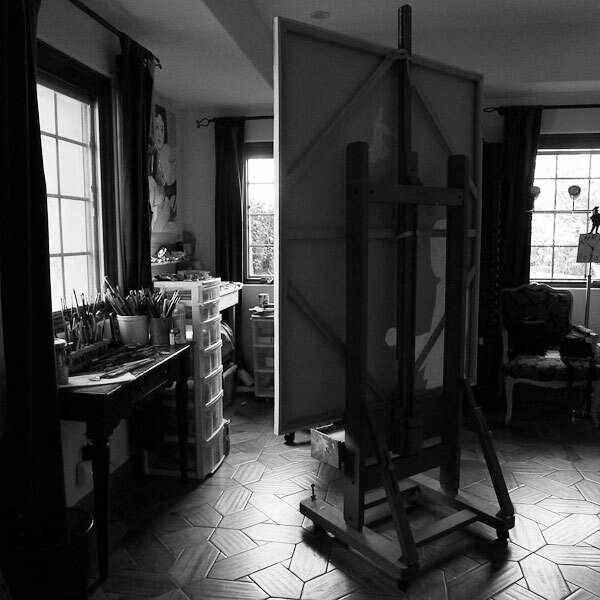 The biggest easel I have is in this room, but I work in the entire house and garage. I work mostly in oil paint but from time to time I get the urge to take out my lethal smelling One-Shot enamels so I go outside and paint. I love the light in my studio, and painting there with my iPod dock blasting is as close to nirvana as anything can be. I spend every day there and sometimes if I have a deadline for a show or commission, I’m there at night too. I have powerful daylight bulb lamps that do the job quite nicely at night. I share this space with a few other people who all do wonderful things. This view only shows the desk and documentation space, but we also have a wood and metal shop around the corner. Though most of my time is spent in the shop, the inclinations of my work begin here. My mind can be tracked by the markings on the floor in the center of the photograph. This is where I pace continuously for hours through the night. 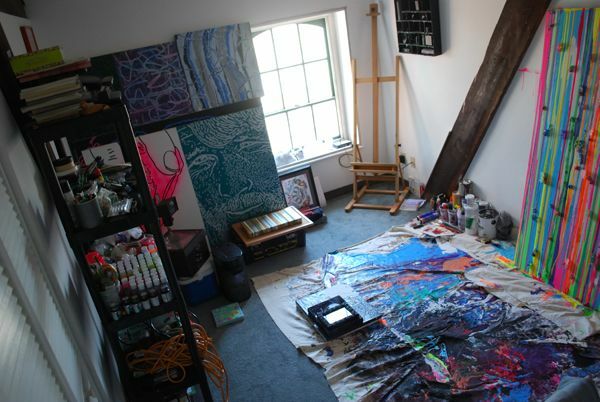 This is the studio that I have set up for myself during my residency at the Vermont Studio Center. I was thrilled to find an enormous window pane that works perfectly as a palette. I keep my brushes and oil paint within momentary reach, so I have a steady, uninterrupted movement of paint to canvas. On my stool, there is a small painting on cardboard and a sketchbook. Each day, I do small studies to test color complexions and ideas for larger paintings that are in progress. On top of my sketchbook, sits my cactus plant that I bought at the church thrift store for only two dollars. I got lucky. I also went to the local farm & garden store and bought a plastic, sky-blue cowbell, which is sitting on the window sill. 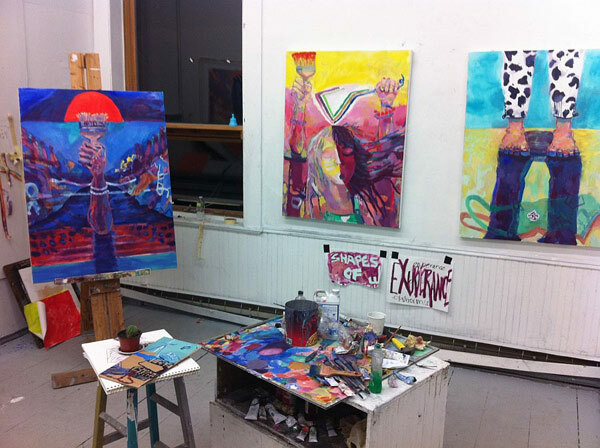 I wanted to bring Vermont into the studio and the cow bell summoned the “Cow Pants” painting on the far right. Below my two paintings on the wall, I have paper taped up that reads “Shapes of Exuberance.” It is a phrase that I’m using to propel imagery forward in my current paintings. I love to create and latch onto verbal cues or pieces of poetry to guide the feeling in my work. When I leave the studio after a long night of painting, those verbal cues are what I carry with me and obsess over until I arrive at the studio the next day. I live on the top floor of an old brewery. The brewery is big. It’s huge. It’s a fortress. I’m a big man. I’m loud.